Artist concept of Odyssey. Image credit: NASA/JPL. A Mars orbiter, launched in April 2001, that is the surviving part of the Mars Surveyor 2001 project. Its main goals are to gather data to help determine whether the environment of Mars was ever conducive to life, characterize the climate and geology of Mars, and study potential radiation hazards to future astronaut missions. It will also act as a communications relay for upcoming missions to Mars over a five-year period. After a seven-month cruise, the spacecraft reached Mars on Oct. 24, 2001, transferred to a 25-hour elliptical orbit, and then used aerobraking over the next 76 days to achieve a two-hour, 400-kilometer-high circular polar orbit. 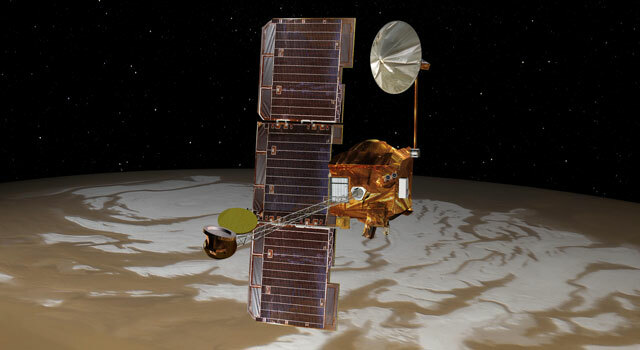 Mars Odyssey carries the Mars Radiation Environment Experiment (MARIE), to measure the near-space radiation environment (important to know about or future human missions); the Thermal Emission Imaging System (THEMIS), to map the mineralogy of the martian surface using a high-resolution camera and a thermal infrared imaging spectrometer; and the Gamma-Ray Spectrometer (GRS), to map the elemental composition of the surface and determine the abundance of hydrogen in the shallow subsurface (indicative of water ice). The spacecraft was named after the famous film/novel by Stanley Kubrick and Arthur C. Clarke.